Brother James Hume Birrell PM, Lodge Clackmannan No. 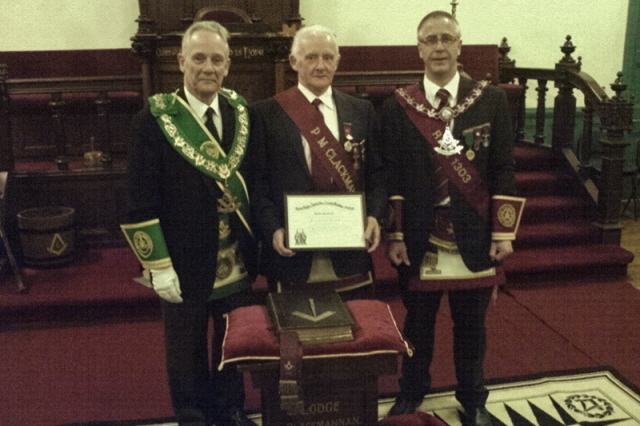 1303, was presented with his 50 Years Jubilee Certificate in Lodge Clackmannan No. 1303 on Wednesday 18th April 2012. Brother Birrell was in the chair of the Lodge from 1973 to 1976. He was also presented with a 50 years jewel acquired by his recently deceased blood brother Alexander Birrell PM, Past Substitute Provincial Grand Master, before he passed away. The photograph below shows Brother Birrell with the Right Worshipful Provincial Grand Master Brother Andrew McKinnon and Brother Ronald Davidson Right Worshipful Master of Lodge Clackmannan No 1303.